Main Road Landscape: After it was built in 1853, the Main Road became the primary route to Alcatraz’s summit. Today, all of the island’s visitors travel up its switchbacks to enter the cellhouse. After construction of the cellhouse in 1912, the army landscaped various roadside garden beds, feeling the need to beautify the approach and entry to the prison. The manicured gardens had an orderly appearance, a reflection of the military’s disciplined style. The gardens changed over time, but always contained a colorful mix of flowering plants, trees, and shrubs. Inmates of the federal prison maintained the plantings until the penitentiary closed in 1963. With lack of maintenance and water in the decades after the prison closure, many of the roadside garden plants disappeared, although some survived (such as the Fuschia, Pelargonium, and roses). Beginning in 2005 the roadside beds were replanted, including the ivy-leaved geranium—the original plant from the 1940s—in the trough atop the wall that borders Officers’ Row. The beds once again create a colorful approach to the upper island. The mixed planting arrangements represent the diverse palette of plants that once existed on the island. Rose Terrace: This garden was developed in the 1920s on the former hospital site and continued to be used into the 1950s. The Rose Garden was a center for garden operations during both the military- and federal-prison periods. In the 1920s, the site contained a rose garden, intersecting paths, and a hothouse, and in 1931, the hothouse was replaced by a greenhouse. Here, Warden Secretary Fred Reichel (1934-1941) trained inmates to plant, propagate, and even hybridize. The greenhouse was demolished in the 1950s and eventually the entire terrace became buried in overgrowth after the prison closed. In 2007, the terrace was cleared of overgrowth and is now used again as an operations area, with a greenhouse, growing area, composting site, workspace, and staging area. Walkways and new plants were installed, and deteriorated railings replaced. Volunteers built the cedar greenhouse in 2010 on the same site as the historic greenhouse. For greenhouse photos click here. Officers’ Row Gardens: Officers’ Row has the longest history of gardening on the island. Because it is on the leeward side of the island, officers and their families lived here and enjoyed gardens out of the wind. In 1881, the army built three officers’ houses here and over the years, residents added gardens, mostly flowering shrubs, on the north and south ends of the houses. In 1941, when the Bureau of Prisons operated the island as a federal prison, it demolished two of the three officers’ houses. Staff families and inmates began planting cutting gardens in the building foundations between the terraced gardens. After the prison closed in 1963, the gardens fell into disrepair. Weeds, ivy, and blackberry engulfed the terraces and the third house burned down during the Indian occupation between 1969 and 1971. 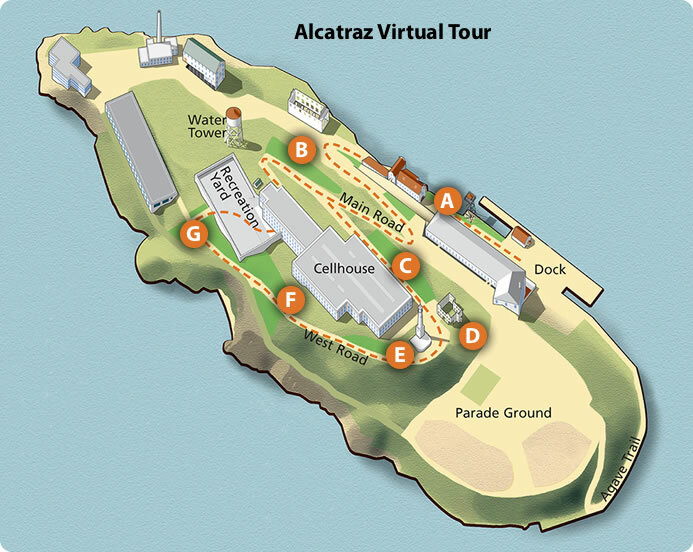 In 2004, the Alcatraz Historic Gardens project team began clearing out the extensive plant overgrowth and uncovered the outline of paths and planting beds, as well as the foundations, some basement walls, retaining walls, and steps. The gardens have been restored to their appearance during the federal-penitentiary period, when staff and prisoners actively gardened. In the northern foundation, the historic hot house that rested against a basement wall was replaced and is now used for propagating plants. Warden’s Garden: The warden’s house, built between 1919 and 1921 for the commander of the army, offers a panoramic view of San Francisco and the bay. Gardens were built around the perimeter of the the house, including a greenhouse on the south side. During the federal-prison era, the house’s residents had exclusive use of the gardens, but maintenance was performed by an assigned inmate. Prisoner Elliott Michener was promoted to work in the warden’s garden near the end of his sentence. The house burned down during the island’s Indian occupation, and only the exterior walls remain. A portion of the garden eroded away and black-crowned night herons now nest in the remaining garden behind the ruined house. The historic gardens are overgrown with Agave, Albizia, Baccharis, Centranthus, Fucshia, ivy, Nothoscodum, Pelargorium, roses, and a large Yucca. Only the foundation of the greenhouse remains, where a selection of the island's survivor plants have been planted and labeled. Cellhouse Slope: In an effort to provide greenery on Alcatraz’s barren slopes and to improve the appearance of the island from the city, the army began a beautification project after constructing its new prison facilities. The southwest-facing slope between the cellhouse and West Road, highly visible from San Francisco, was planted with bright lavender ice plant, referred to by residents as a “Persian carpet.” The groundcover not only enlivened the slopes but provided effective erosion control. Eventually the plantings died off from lack of maintenance. In 2008, the ice plant was replanted. West Lawn and Terraces: In the 19th century, the army excavated a level area for a corral and stables, but removed these improvements after 1912 and planted a lawn on both sides of West Road. During the federal-prison era, inmates transformed sections of the lawn into a garden and planted a variety of flowering shrubs and perennials bordering the road. The remains of West Lawn are still visible on the east side of the road, now a field, but the west side of the road is overgrown with a dense thicket of plants—Albizia, blackberry, Coprosma, Cotoneaster, fig, and ivy—that protect nesting waterbirds. The borders of the road have been replanted with flowering perennials, shrubs, bulbs, and succulents and the terraces below the lawn are overflowing with succulents and other survivor plants. Prisoner Gardens: In this area, Elliott Michener and his successors created gardens for the eyes of their fellow prisoners and for their own satisfaction. Inmates routinely passed through the gardens on their way to their jobs at the New Industries Building. At the base of the recreation yard slope, prisoners tended cottage-style cutting gardens and built a small greenhouse west of the walkway, but only the foundation remains. Prisoners also planted the slope on either side of the stairs below the recreation yard. Elliott Michener worked for years to improve the soil conditions and then plant Drosanthemum (ice plant), which helped with erosion control. Now the slope has a variety of plants that have survived over the years—Aloe, Drosanthemum, Acanthus, Watsonia, and Pelargonium.